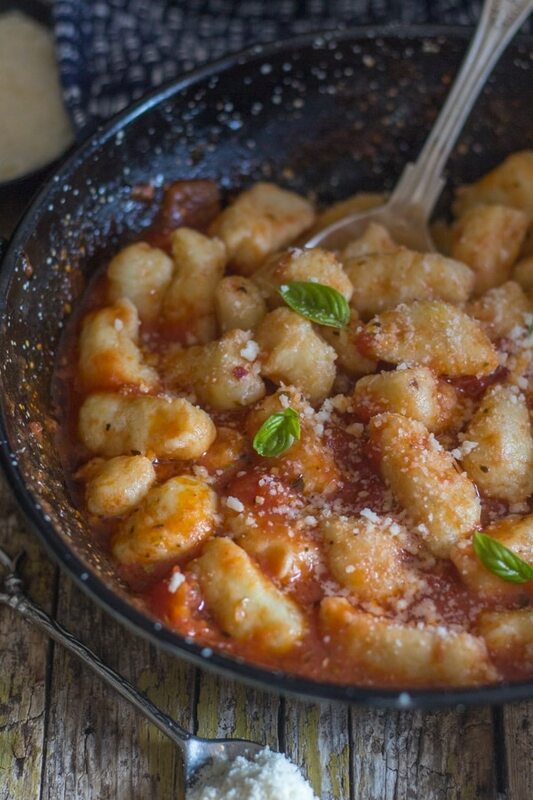 An easy Italian Pasta Dish recipe, Homemade Potato Gnocchi. 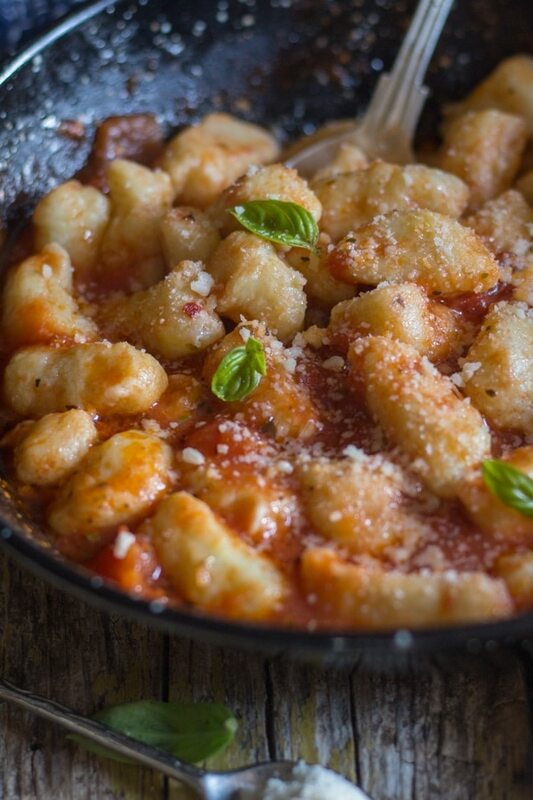 A simple tomato sauce makes these soft, delicate Gnocchi a delicious Dinner idea. Living in Italy has made me realize that the simplest dish can be made in so many different ways, depending on the region or even how the family cooks it. That of course also includes how to make Gnocchi. I have been told to use just flour and potatoes, or use some milk instead. But the best way I found is flour, potatoes and an egg. 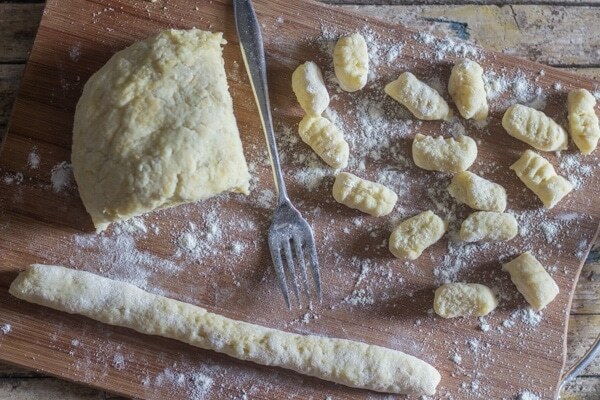 4 Ingredients for Gnocchi, flour, salt, potatoes and an egg. Gnocchi Dough, rolled then cut. So how did I come by this recipe? I have a great little family owned supermarket just down the street from me where I can get fresh eggs and really good cold cuts, slabs of pancetta, fresh nuts and other goodies and my just-purchased pressure cooker. If you need it, they have it! Over the years the woman who owns the store has also become a friend. She is originally from the South of Italy and left her family to marry and move North. Gnocchi sprinkled with flour and resting for 20 minutes. With the store business and family to take care of she doesn’t see them as often as she wishes. My move from Canada to Italy was a little more extreme, but it was something we had in common and gave us something to break the ice. So over the years I have acquired a good friend and some good recipes. This Gnocchi Recipe being one of them. 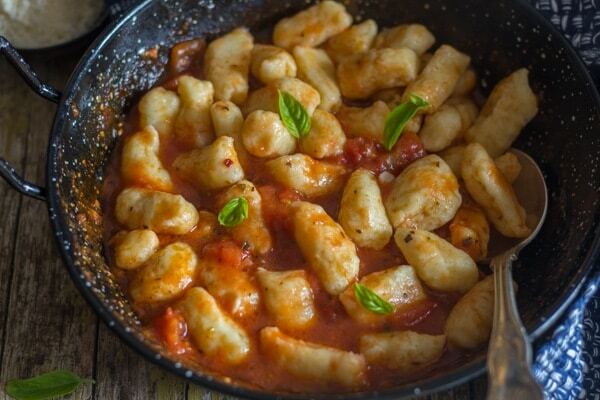 What kind of sauce is best for Gnocchi? 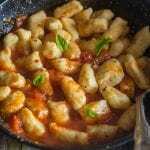 There are several ways that you can serve Gnocchi, probably the most popular being a simple tomato sauce, you could also toss them with Pesto, butter and salvia or even a simple cream sauce. Potato gnocchi can be left uncooked for no more than a couple of hours (covered). Cooking may be a little longer because they will have dried out a bit in the air. 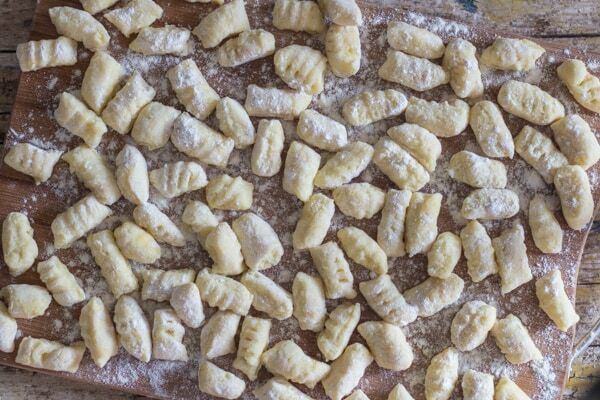 The Gnocchi can also be frozen, place the uncooked gnocchi on a cookie tray in the freezer, leave for approximately 20 minutes then place them in an airtight freezer bag. They will keep for about 1 month. When you cook them there is no need to defrost, just add them to boiling salted water. Boil the potatoes with the peel on, that way the potato absorbs less water. Peel the potato and place through a potato ricer immediately, because the cooler they get the stickier they become. An easy way to peel the potato is stick a fork through and peel it using a knife. Although you should wait for the riced potato to cool before adding to the flour (or denaturation may occur). What is the best Potato for making Gnocchi? The perfect potato is an old potato, in other words no new potatoes. New potatoes contain more water which absorbs too much flour. Go for Yukon Gold or Russets. So anytime you are craving a tasty home-made pasta dish, and you need it now and fast, Gnocchi are perfect. In an hour you could have a delicious pasta dish on the table and you can say “I did it myself”. Buon Appetito! I earn commission from Purchases made via Product Links in my Posts – thank you. In a large pot boil potatoes until tender, remove from the pot and let cool remove the skin. Then pass through a Potato Ricer. 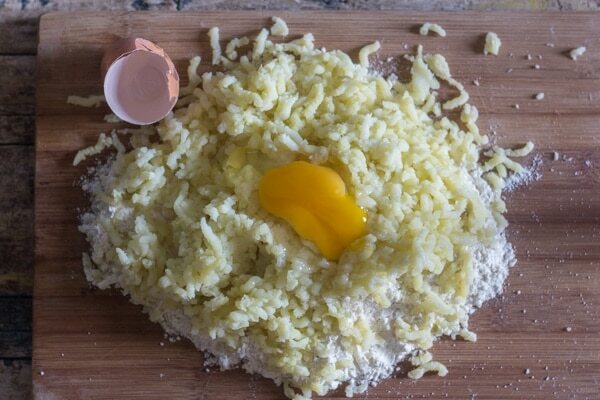 Mix together the flour and salt and place on a flat surface, make a well in the middle and add the potatoes and egg, mix together with your fingers to form a soft dough, it should not stick to your fingers. On a lightly floured surface, cut small amounts of dough to form ropes and cut into 3/4 inch (2 cm) pieces, then slide each piece on a fork and squeeze a little (but not too hard). Sprinkle with a little bit of flour and toss, so they don't stick together. Let the gnocchi rest for 20 minutes before cooking. While the gnocchi are resting make the sauce. In a large saucepan add olive oil, tomatoes, salt, garlic, oregano, basil, hot pepper flakes and water, stir to combine, half cover and let simmer over medium heat until thickened. Remove cover for the last few minutes to thicken. In a large pot of salted boiling water cook the gnocchi, gnocchi are ready when they float to the top. Drain and add to the cooked sauce, add a little pasta water, cook for 30 seconds, gently tossing. Serve immediately topped with fresh grated parmesan cheese if desired. Enjoy! Updated from December 16, 2014. I’m a recent convert to gnocchi and now I’m obsessed by them. Have made ricotta gnocchi with Kenji Lopez-Alt’s recipe on Serious Eats. Those are fabulous & these look amazing too. Any idea what I could sub for the egg for my vegan son? Hi Bethany, I have never made these gluten free, but I have heard you can get some great gluten free flour now that you substitute 1 for 1. If you try it let me know how it turns out. My grandma came from Abruzzo, Provincia d’Aquila, and made gnocchi all the time for my grandfather. Her ingredients were the same as yours (NEVER ricotta because grandpa didn’t like them that way and she always cooked to please him). My memory of her gnocchi was that they were on the firmer side with a definite bite to them. I would like to make mine as close to my memory of hers as possible. Any suggestions? I don’t think anyone would have considered her gnocchi “light little pillows” but they were delicious, NEVER mushy. Any suggestions? Hi Erica, so I discovered that you should use red skinned potatoes, boil them whole with the peel on, remove the peel when they are still hot and pass immediately through a potato ricer, but let it cool before adding to the flour. I hope this helps let me know. If I don’t have a potato ricer, would just using a regular hand masher work? Or would something like the large holes on a cheese grater be better? I think I might have found a reason to finally get the potato ricer haha! Hi Monica, I think a grater would be better, a find a masher can leave some lumps. Hope that helps, let me know how it goes. Hi Shawnna, thanks so much. If using in soup, would you cook the gnocchi first? Or can you place in the soup and cook that way. Hi Pat, I have never cooked gnocchi in soup, but I would say, when the soup is done throw in the gnocchi and cook until floating to the top then serve asap. Let me know how it goes. i have been making them for years but seems lately something isoff. I use leftover mashed potato, parm cheese and flour. I omit egg because the potatoes have milk and butter in them. i roll into log cut off and roll on fork tines. Now my problem is they are too soft and almost mushy despite dropping into boiling water and pulling out as soon as they float to top, Do you think an egg would help or just add more flour? Also a local restaurant uses ricotta cheese only. Any takes on how to proceed with cheese only? Hi Michelle, I would add more flour, an egg would just make them mushier. Let me know how it goes. 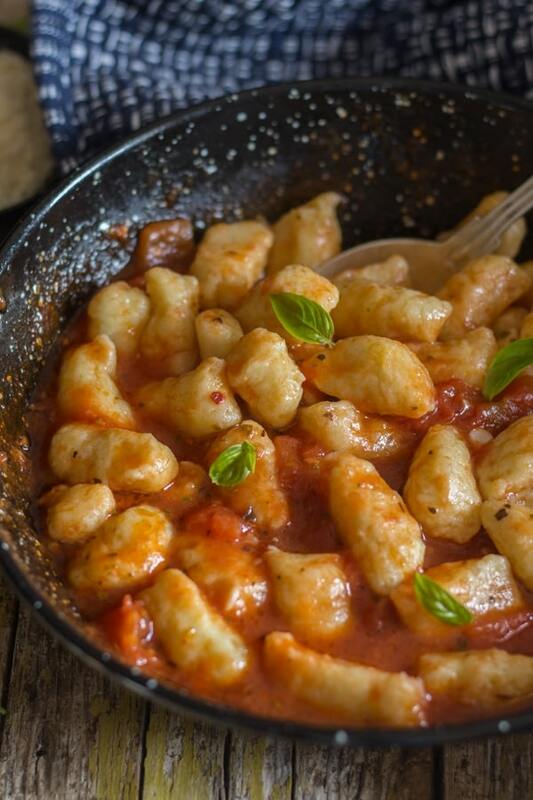 I love gnocchi, but have always been too intimidated to try making it – after trying a store bought version (which is so not good, in case you were wondering!) I decided to stick to only having it in restaurants. You make it sound simple, so will give this a try! Hi April, I hope you give it a try they aren’t very difficult. Let me know how you liked them. You are making me hungry ! They look delicious! We also make gnocchi with farina ( cream of wheat) eggs and Parmesan cheese. They are delicious and fantastic in brodo. Hi Marisa, thanks, sounds good with parmesan cheese.